W is for Why is Nature so Weird? Able assistants ME and LS at the Harrowing Farrowing. Talk about stepping up to the plate! These two were GREAT! 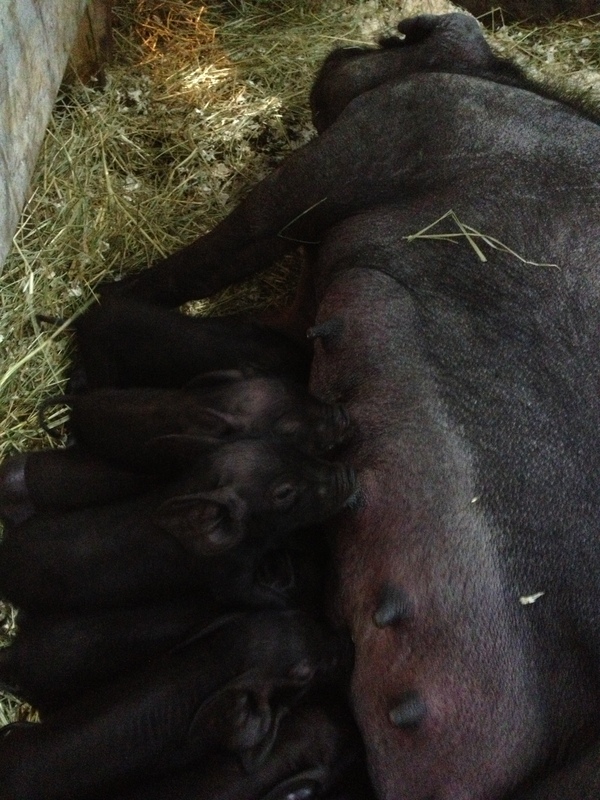 We arrived down at the barn early the morning after Olivia delivered (and rejected) her 11 piglets. Overnight, one of them had wandered into the safety pen but didn’t get out of the way fast enough and was squashed. The others, though, were under the heat lamp. Olivia was completely uninterested in lying down and letting anyone have a drink. By this time, the colostrum clock was ticking – if newborns don’t get that first milk produced by the sow, they miss out on all sorts of antibodies that help keep them healthy until their own immune systems have time to kick into gear. Milking a fidgety sow is no picnic. As ME stoked, massaged, and cajoled the sow, I did my best to milk a bit from each teat into a small container. Each time I had accumulated about 3ml, I’d draw it up in a syringe, catch a piglet, and convince the screaming, snapping, squirming little creature that I wasn’t trying to kill it. Usually when a few drops touched the piglet’s tongue it would realize what was going on and have a total attitude change. Of course, the attitude change was short-lived because 3ml doesn’t last a hungry piglet long at all. After I’d hand fed a couple of piglets (starting with the smallest, weaker ones and working my way up to the hefty brutes), I would join in the massaging, cajoling, cooing, and pleading to try to get Olivia to lie down and do the job of feeding the babies herself. Though she was quite happy to talk to us (and be massaged), every time a piglet came close (either wandered in to the safety pen or was placed there when she happened to lie down for a moment) she would charge, pounce, and toss. Piglet screams are heart-breaking to hear. I milked a bit more, hand fed another two or three and tried to figure out what the next plan might be. It’s not uncommon to use a sedative like Stresnil to stop sows from savaging their piglets. This, though, would have required a trip to the vet as I didn’t have any on hand, so I turned to my phone and consulted google. Of the many suggestions offered (some useful, some downright rude), one comment made some sense.”Give her a pint of stout.” This was from an old pig farmer who had probably helped more sows farrow than I will ever have the chance to do. A quick search online and it seemed that giving her a bit of beer might actually help stimulate milk production and that the amount that would be transferred to the piglets would not be harmful. At this point, I was looking at losing a whole litter of piglets if I didn’t take drastic action, so I hiked up the hill and grabbed some Corona. I mixed two bottles with Olivia’s breakfast chow (which she slurped down quite happily) and waited and watched. While we waited for the beer to have some effect, I milked some more and continued to feed the remaining piglets a few droplets of the precious colostrum. After a bit, Olivia sighed and settled into her hay nest. We massaged and she exposed her teats. I brought her a piglet and she leaped to her feet, spun around, and threw it aside. We waited 15 minutes and tried again. Same result. I gave her another beer and more kibble and we repeated this whole routine, cringing at the squeals of hungry piglets being soundly rejected by their mother. At this point I was thinking maybe I had completely miscalculated. Perhaps this was going to be a sow who would become violent after drinking. Maybe Olivia was going to be the exception to the happy sow rule. Olivia is a large pig, outweighing me by several times over. 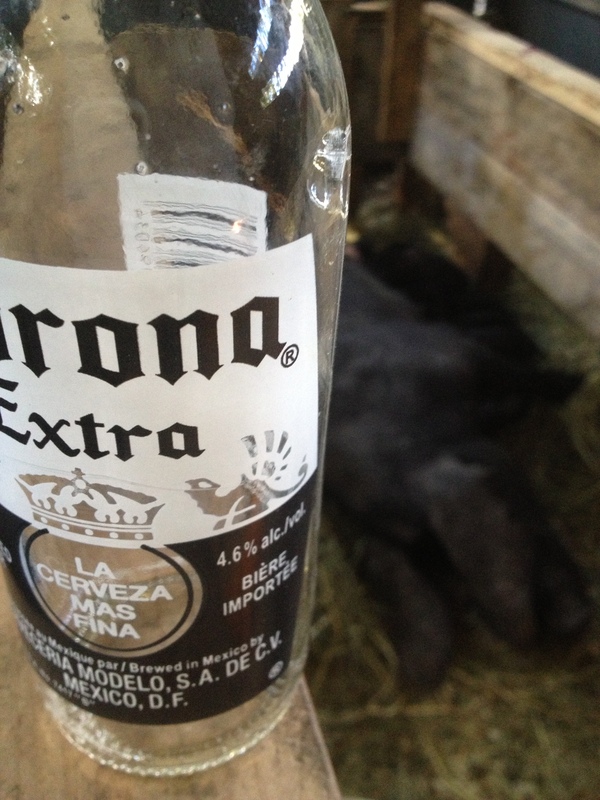 I eyed her, looked at her hungry piglets, and cracked open another Corona. She happily guzzled it down along with a bit more feed, we waited 15 minutes and repeated the massage routine. Now onto us, Olivia braced herself against the safety pen wall, determined to stay on her feet no matter what. In what was likely the only mildly humourous moment during this entire ordeal, after four beers, a lot of breakfast, and two humans massaging her tummy, she could not resist and sort of eased herself down the wall, rolled on her side, and sighed. When in doubt, a pint of stout… or, a bottle of Corona. Tentatively, I brought her a piglet. It latched on and started to suckle. Olivia shifted a bit to get more comfortable. Before she changed her mind, I grabbed another piglet, and then another. We now had three nursing and she was finally starting to behave like a proper mother. I added more piglets until, hallelujah, they were all nursing, and making that very particular happy piglet snurgle snuffle noise that is oh so much better than than the screaming in terror squeals we had been hearing up until this point. Now 48 hours after farrowing, we have 8 survivors – one more was squashed on the second overnight and a third was smaller and weaker and couldn’t compete with the other, hefty siblings. I suspect it might have survived if Olivia had been more cooperative early on. Unless something strange happens (I shouldn’t tempt fate by even speculating what might go wrong at this point), the rest of the little porkers should do just fine. 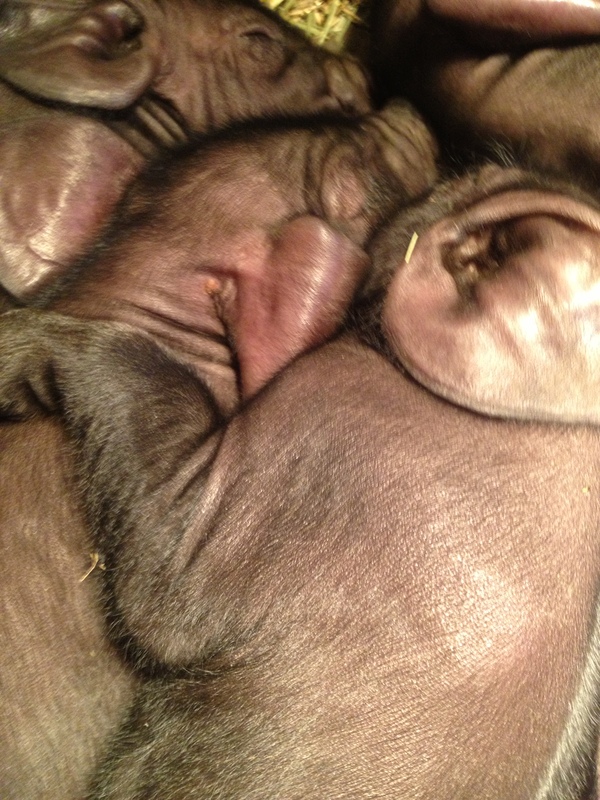 With their bellies full and now quite familiar with the route between Mama and heat lamp, the piglets are catching up on their sleep. Can you hear their cute little snores? This entry was posted in Blog, Pigs, workaway and tagged #atozchallenge, a to z challenge, farm life, farrowing, hogs, Large black hogs, piglets, sow won't nurse, workaway. Bookmark the permalink. SOOO glad things are OK now – what a marathon for all of you, and how very stressful. Congratulations! Fascinating – thanks for the link! This was a very quick start to finish farrowing – and she didn’t really hop up and down that much as we were able to whisk the piglets away all oft before she realized she’d had a other one. I’m thinking its more likely genetics as the LBH gene pool is very limited. I, too, am very glad it’s all over! What an interesting story. And it has a happy ending. Well told. You both were determined to succeed. By some good fortune of beer on hand, and higher order thinking skills, you massaged her into submission. Congratulations. I hope all goes well for the little porkers. Thanks, Jim – our fingers are crossed it’s smooth sailing from here! Alas, her first litter was born in a rainstorm, out in the forest, before we had our safety pen set up. We wound up with four survivors out of a litter of eight. Same kind of trauma except we couldn’t be nearly as hands on as she was very aggressive with us, too – sent me flying at some point when I tried to retrieve a piglet. In her last litter she did eventually let them nurse overnight without intervention, which is why I thought perhaps the same would happen this time if we left her in peace. For the first litter we had a heat lamp and creep area set up in one of our hog shelters but there was no safe way for people to work around her or to save piglets when she attacked them. Because she was roaming around a lot during that delivery, we did manage to save several by plucking them out of mud puddles with a long-handled fishing net… In the first litter, she often didn’t even bother to lie down to deliver a piglet – stood up (looking grumpy) and shot them out. Oh my! Your last sentence cracked me up…. What a character your sow is! Amazing how strong they are, isn’t it?? I bet you were glad to be done with the whole ordeal of waiting and wondering. It always seems like they always deliver in storms too. Congratulations on the new babies! I would have been ready for a couple of Coronas after that, too! Here’s hoping the babies are all healthy and worth their trouble. I have no answer for your question, but it’s a fascinating story very well told. We’ve had to consult the Google on occasion to figure out what to do but I expect I would have been dubious about advice to give her beer. But having read your post it makes perfect sense. Maybe she just needed to be settled down a bit and a beer (or 4) would do the trick. Well done and best wishes for the little piggies. I was dubious, too! But I was also getting a bit desperate at that point… The whole family is doing well now so it seems there were no ill effects! We were trying to save a hypothermic kid once and someone on the Google advised giving the kid coffee. That sounded ridiculous to me, but we were getting desperate too so we did it. The kid revived. It was amazing. Wow – sounds like there’s a story there!! Glad to hear the coffee worked! Wow, what an ordeal! Fascinating. I’m glad it had a happy ending for the eight of them, at least. Here’s to a good mother-piglet relationship from here on! *raises beer* Cheers! My first sow was very nervous with her first litter, couldn’t understand what all these screaming things running around were, she thought she liked them but they were scary! 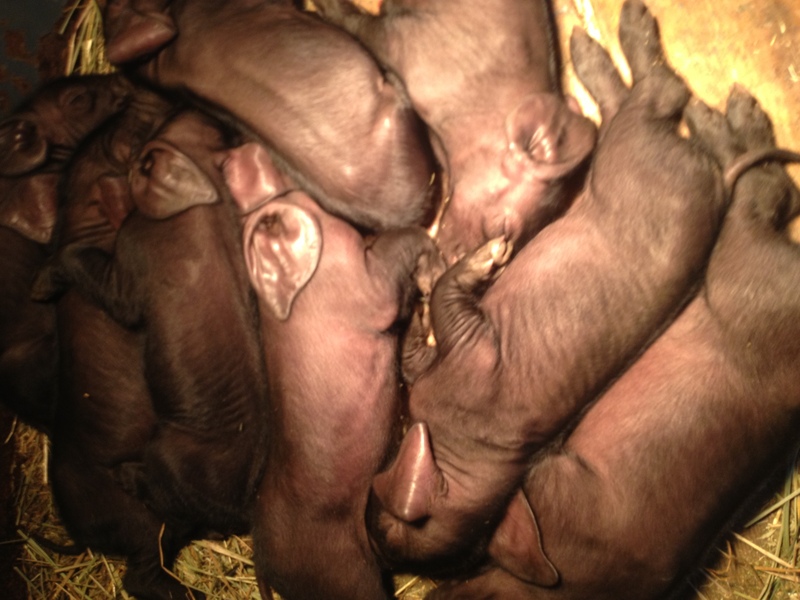 Luckily when i got her to roll over a little brigade of piglets came matching over and latched on. Amazing to see the difference when oxytosin hits momma.